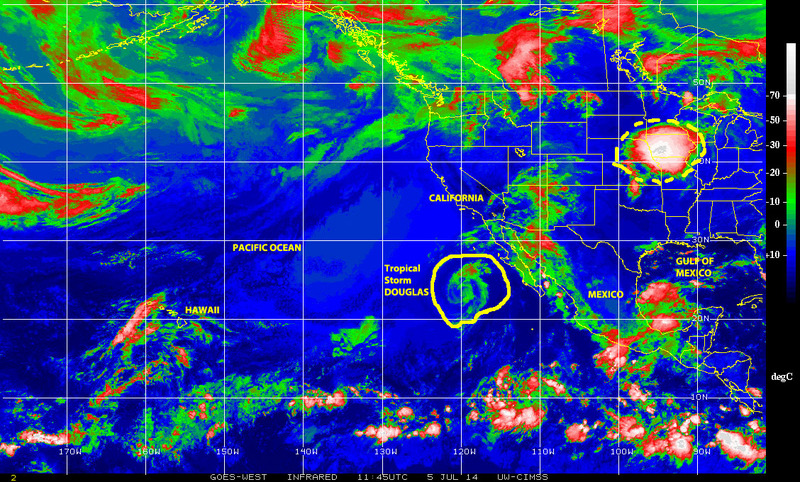 JULY 5, 2014: Plenty of Cyclonic Activity! 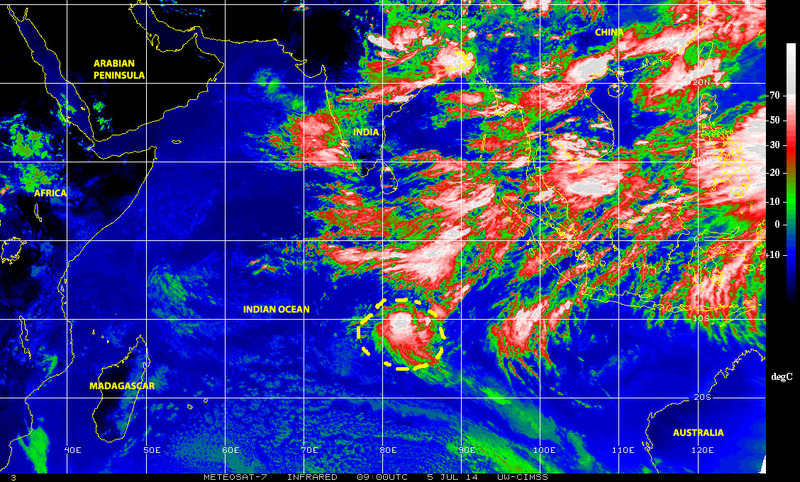 This morning of Saturday 5 July 2014 we awaken to plenty of cyclonic activity around the world. ARTHUR has now degraded to a still strong tropical storm while dumping lots of rain over the northeastern USA and eastern Canada as it continues to track toward the northeast. 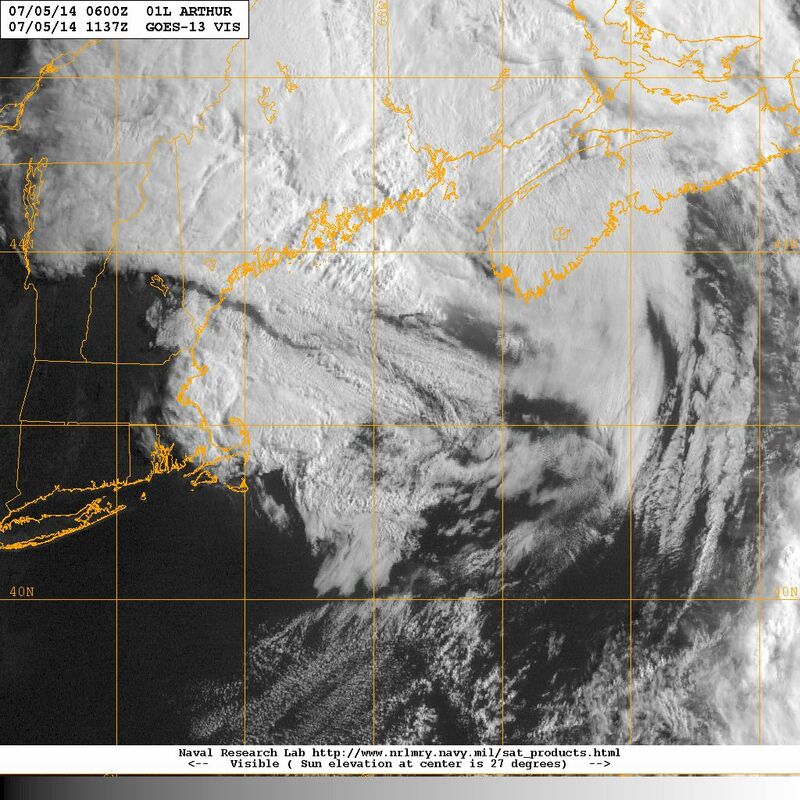 The storm is getting quite disorganized, and it presents a ragged appearance in satellite imagery. The heaviest and largest area of precipitation is to the northwest of the center of circulation. Also in the Atlantic basin we see ‘Hurricane Alley’ populated by a string of storms generated by tropical waves on their way from Equatorial Africa toward northern South America and the Caribbean. On the other side of the continent, over the eastern Pacific we still have what is now a weak tropical storm DOUGLAS tracking northwest. To the southeast of DOUGLAS there are several cells of disturbed weather off the coast from Panama to Central America and southern Mexico. 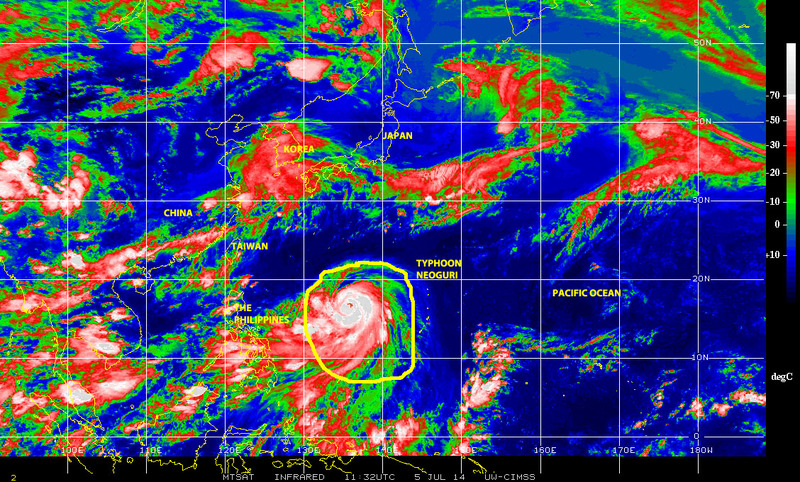 Thousand of kilometers to the west of DOUGLAS, in the northwestern Pacific over the Philippines Sea we can see a strong Typhoon NEOGURI tracking NW over a rather favorable ocean-atmosphere environment, which will most probably cause it to strengthen possible to a category 5 0ver the next 48 – 72 hours. Last, but not least, there is a strong tropical wave over the Indian Ocean south of the equator that is showing cyclonic characteristics and may warrant further observation. While not record-breaking this is quite a ‘cyclonic day’ in Planet Earth! It is Monday 30 June 2014! We are coming up on the first 30 days of the 2014 Atlantic Hurricane season and the 47th day of the 2014 (East) Pacific Hurricane season. The Atlantic basin has been rather quiet so far, but Florida has been “under the influence” of disturbed weather systems coming in from the Gulf of Mexico, the extreme northwestern Caribbean, or from ‘mainland USA’ as large storms over Texas and the southern portion of the country have affected our state as well. Florida has seen its share of extreme rain and thunderstorms over the past few weeks, from the panhandle to South Beach and the Keys. 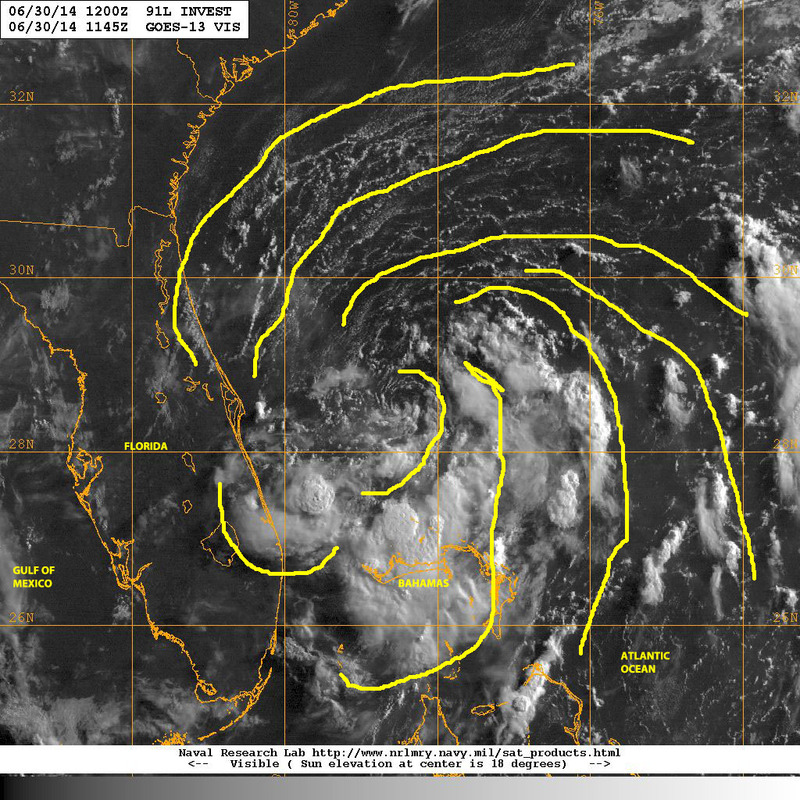 Currently a low pressure system that has been sliding along the Florida coastline in the general direction of Southeast Florida is starting to show some potential cyclonic characteristics, and the possibility for further organization and strengthening as it comes into a favorable environment. It would appear the region is in for a couple of days of rough weather toward the middle of the week. Also currently, Tropical Storm DOUGLAS, the fourth-named tropical cyclone of the 2014 season is near the Pacific coast of Mexico moving NW away from land. DOUGLAS is chased by a low pressure system closer to the coastline, which appears to be strengthening. Both of these systems are generating plenty of rain and thunderstorms over a wide region from central to southern Mexico. 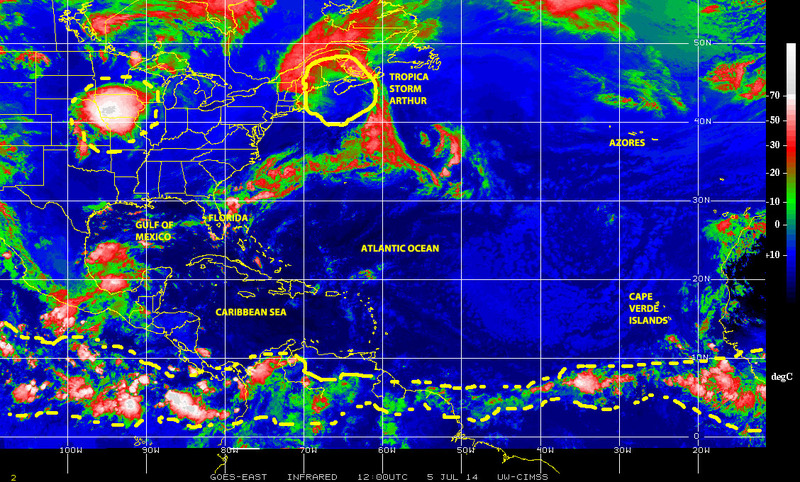 Back in the Atlantic basin we are continuing to see a more continuous presence of storms, disturbed weather cells, and tropical waves along ‘hurricane alley’, which had ever so slightly continued to shift northward. But, on the other hand, production of tropical waves in the ‘assembly line’ in Equatorial Africa has been somewhat spotty, so there is no steady and reliable supply of ‘cyclone seeds’ for hurricane alley. Let’s wait and see how these various systems evolve in coming days, or what new systems may develop. While doing this we must remain alert, be prepared, and always continue to practice mitigation!